As noted in The Lake That Isn't, the building that houses Lake Chalet was a pump house for the Oakland Fire Department before the wings were added in 1913 for boats. The building fell into disuse and disrepair, then was renovated and reopened in 2009. 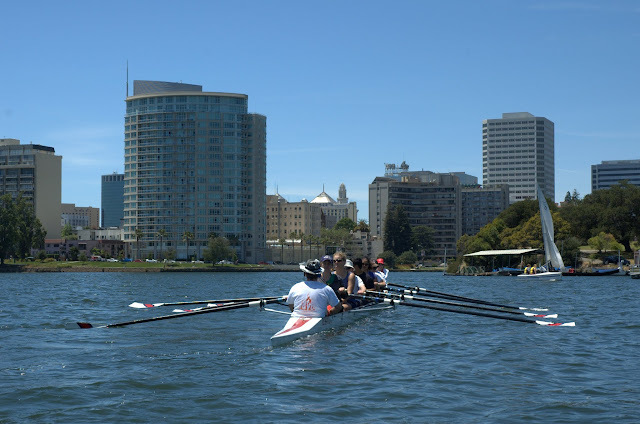 Now one wing houses Gondola Servizio, while the other is back to its original purpose—housing boats for the Lake Merritt Rowing Club (LMRC). Saturday was National Learn to Row Day, so the LMRC and other rowing clubs around the country had open houses to introduce people to the sport. It started with a brief tour and explanation of rowing. The first thing I learned was the difference between sculling and sweep rowing. Sculling refers to using two oars per rower; sweep rowing refers to using one oar per rower. (If you're confused by this usage of sculling, you're not alone. My first thought was the single-oar method of sculling. It's taught for propelling any sort of small boat in an emergency, whether a becalmed sailboat or a rowboat where you've lost an oar.) While the LMRC teaches both, the open house was focused on sweep rowing, demonstrated in boats with 8 rowers plus the coxswain. That allowed a mix of 4 experienced rowers with 4 new rowers, and also teaches the teamwork aspects. After reviewing the equipment, people moved to the "ergs" (short for ergometers), to learn and practice the basic rowing stroke on dry land. Unlike a basic rowboat where rower and oars stay fixed relative to each other, in a rowing shell, the rower is on a seat which slides back and forth during the stroke. The stroke for rowing is both simple and complicated. It's a 3-part process, arms, body, then legs, but all in a fluid motion, while keeping the oar level, but simultaneously keeping it clear of your legs. Ultimately most of the strength comes from your legs, not your arms, but if you're doing it correctly, rowing provides a full body workout. Then it was on to one of the trickiest tasks—learning to get into and out of the boat safely, without tipping it over or pitching yourself into the water. With everyone safely aboard plus 4 experienced rowers, a coxswain to give directions, and a chase boat following in case of emergency, it was time to push off from the dock and start rowing. People quickly learned rowing is a team sport. Not only do you need to use the correct rowing stroke, you need to do it at the same time as your boat mates. The coxswain sets the pace, but everyone needs to follow it. By the time the boat had been up the lake and back, people seemed to be getting the hang of it. Rowing is a fun sport and a good workout, for ages 12 to 90+. 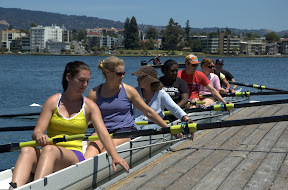 The LMRC offers classes, and has a special summer series for youth rowing. Scholarships are available. If you'd rather just watch, rowers are out early many mornings practicing. 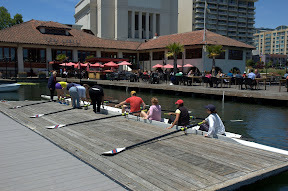 The LMRC is hosting a regatta on July 1st, the 2012 Southwest Masters Regional Championships, so you'll have a chance to check out competition, too.